The Blues Brothers is a critically and commercially acclaimed musical comedy film released in 1980. The film was directed by John Landis and co-starred John Belushi and Dan Aykroyd. The film has since gathered a cult following status. 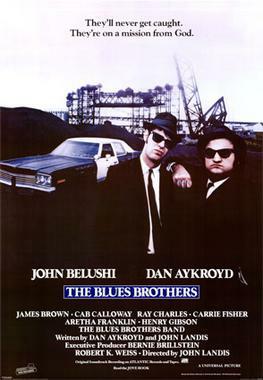 The Blues Brothers was filmed during the summer and fall of 1979, primarily around Chicago and its surrounding suburbs. The film was originally intended to be a roadshow attraction, lasting nearly three hours and including an intermission. The roadshow cut was shown only once at the Picwood Theater in West Los Angeles where afterward Landis was asked to make cuts. A preview cut was then shown after Landis trimmed 30 minutes of footage. After the preview cut, the film was trimmed down to 133 minutes, which was used as the theatrical release. In the early 1990s Landis wanted to go back and restore the original roadshow cut. To his surprise, he discovered that Universal Studios had thrown out all the original outtakes and negatives in 1985 to make room for other programs in their vaults. Scenes from the roadshow included extended dialogue, car chase sequences, and musical numbers. One notable cut was a number sung at Bob's Country Bunker, Sink The Bismarck, which only exists in audio form today. Other outtakes can be seen in the films original trailer. Shortly after Landis discovered the roadshow was likely gone forever it was found that the theater managers son had stolen the print of the preview cut after being shown. Universal Studios and the FBI got involved in the case and confiscated the footage after he attempted to sell the copy on eBay. The preview cut is known today as the extended edition of the film; running at 148 minutes. This version can be found on subsequent VHS, DVD, and Blu-ray releases. However, the extended scenes aren't upgraded and color corrected to match the rest of the transfer on the Blu-ray. The Blues Brothers theatrical trailer.